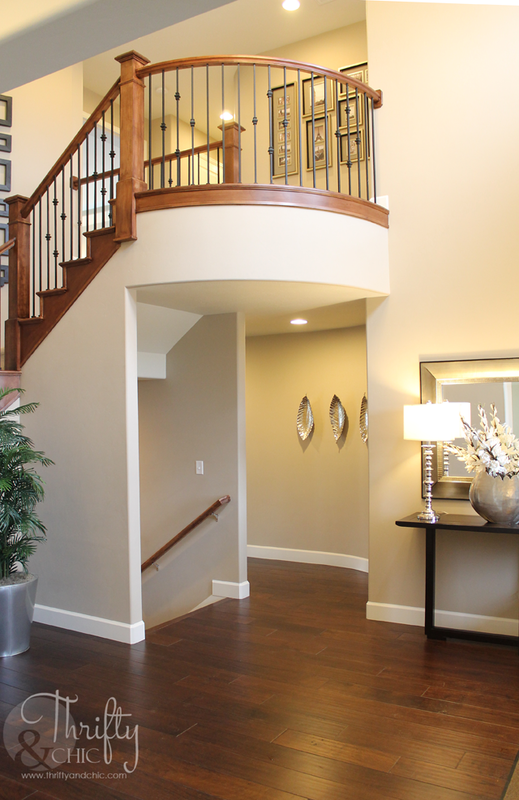 Here's the entry way. The curved balcony and the curved wall below is so beautiful, don't you think? 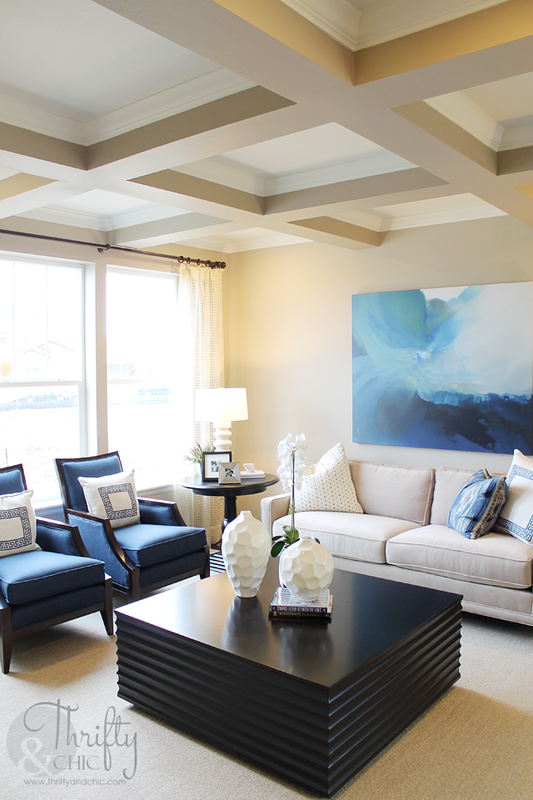 The coffered ceilings in this front room are just amazing. These kitchen cabinets make me question if I should stain mine instead of painting them. The only problem is that I have black granite, so I'm not so sure how that would look. I would die to have this light granite in my kitchen. Love it. 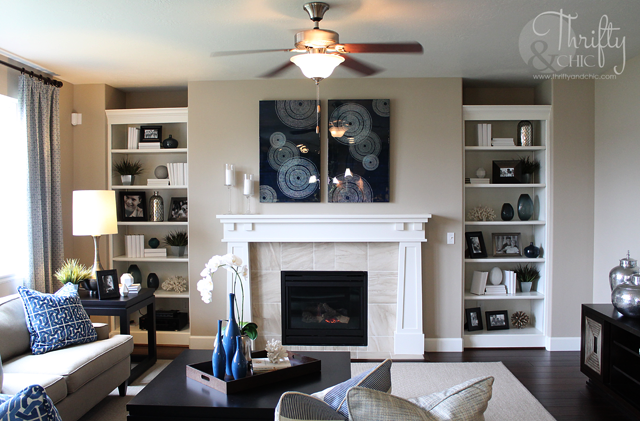 I love this living room, mainly the built in bookcases and the fireplace. 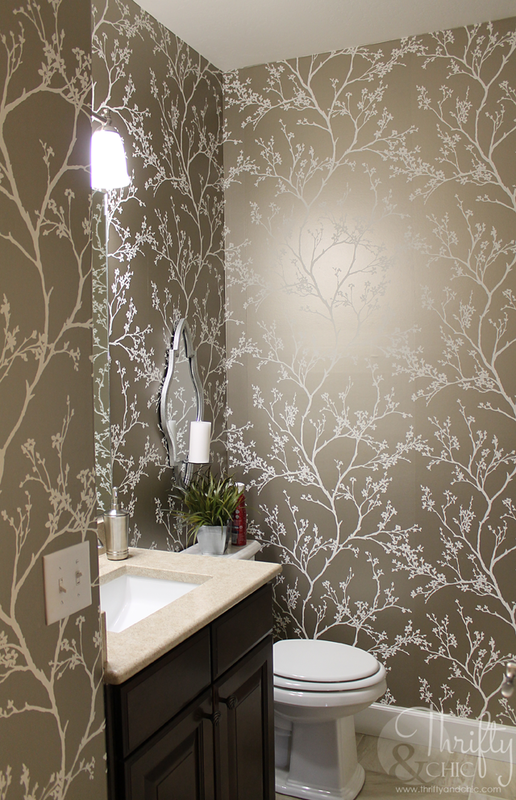 And who wouldn't love this bathroom? I need to find out where to get this wallpaper!! Okay. So, the master suite. It is seriously like 800 square feet total. It is huge and amazing. Here's the bedroom portion...loving this headboard. 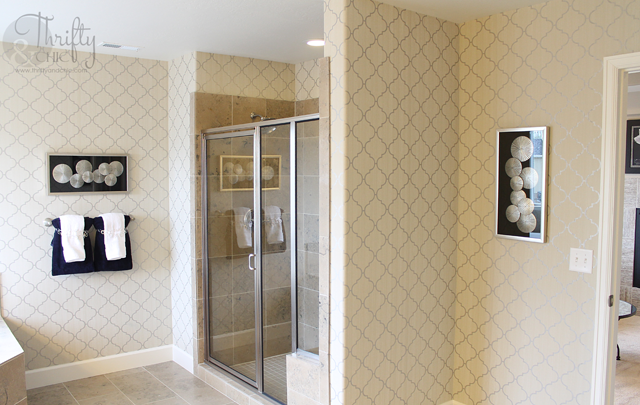 And the master bathroom. This is only like half of the bathroom, it's that big. Don't you love the wallpaper? Okay. So, let's start the oddness of the decor, shall we? 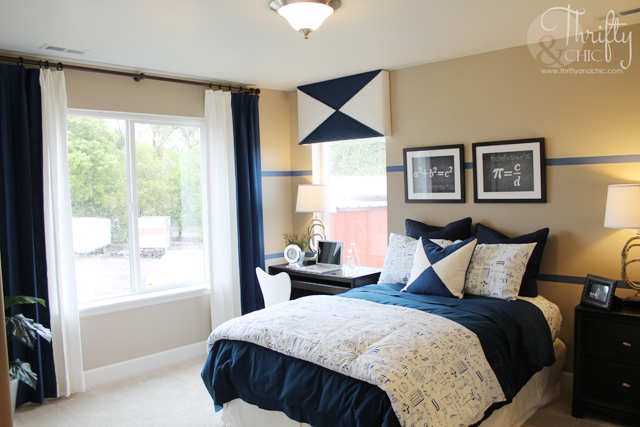 :) This room decor has potential, but then add in the painters tape lines?? hmm. 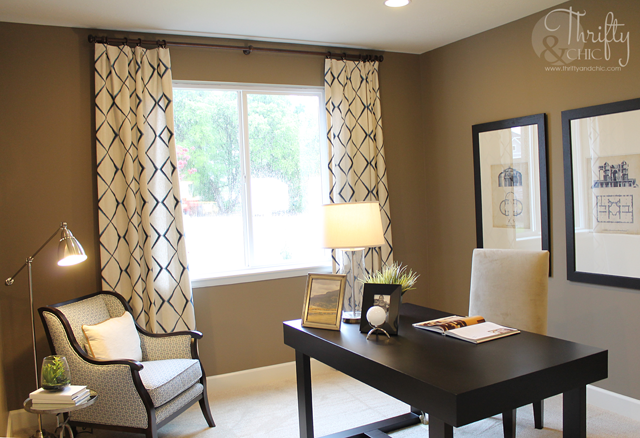 This room actually works for me, the painters tape is now horizontal, and not such a statement like the other rooms. And the basement. 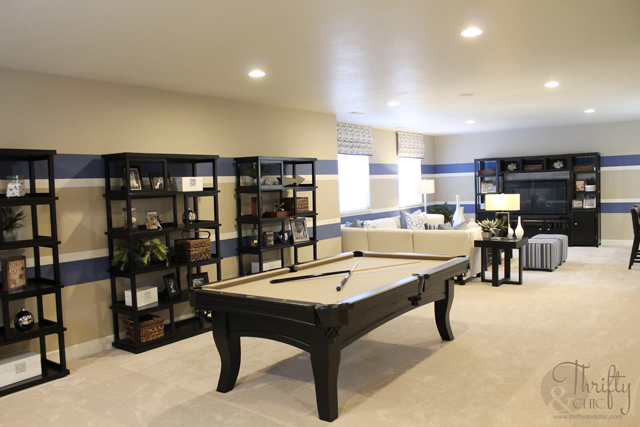 It has this huge game room and family area, along with a kitchenette, another bedroom and bathroom....along with the nice blue stripes too of course. So, what did you think? Fan of all the blue?... like seriously no other accent color but blue. And the stripes on the walls? Love em or leave em? Hi, Alicia! I agree that the stripes must go, and blue is great--in moderation. All of the interior walls seem to be too dark for my taste-- why have all that wonderful space and then make it seem smaller with color? 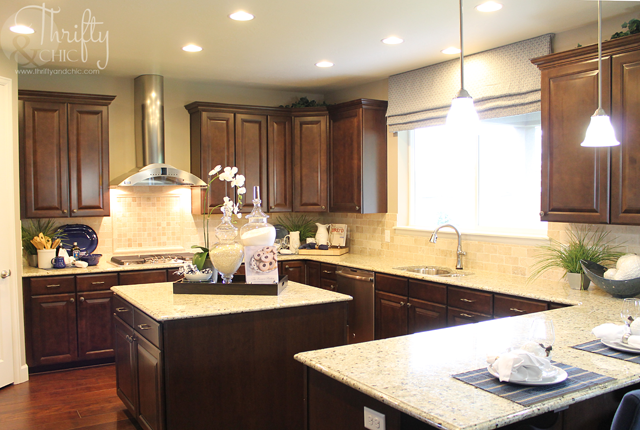 Also, your black granite countertops would probably be stunning with cabinets painted a light grey-blue color! 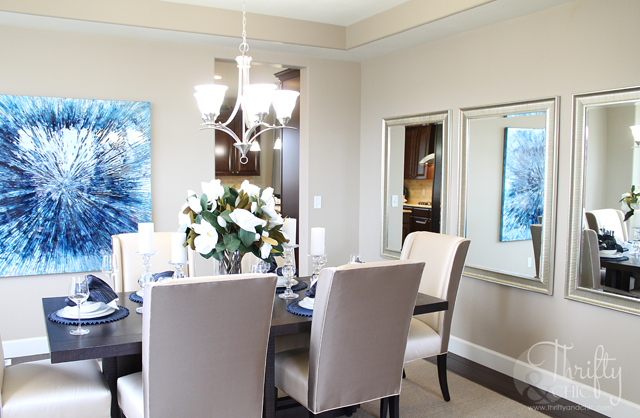 Thank you for sharing these homes with us. 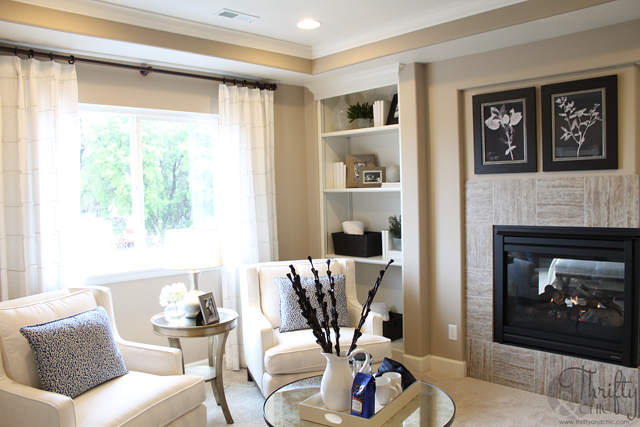 Can't wait to see what you found in the Parade of Homes. When my children were little I worked part time as hostess in new homes for a couple of builders and the Home Show weeks were always a lot of fun. Have a great week! 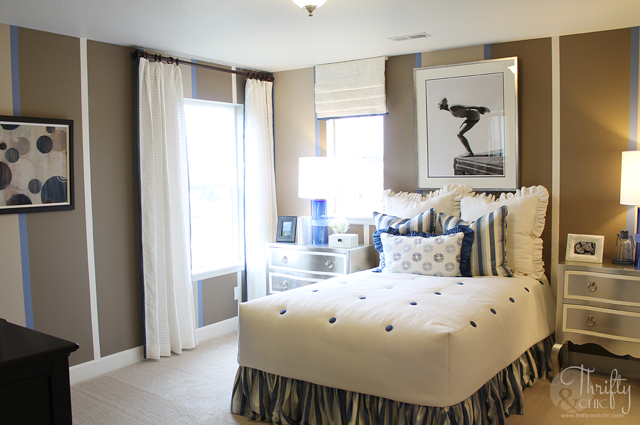 I like the striped walls in the basement, but not the bedrooms. 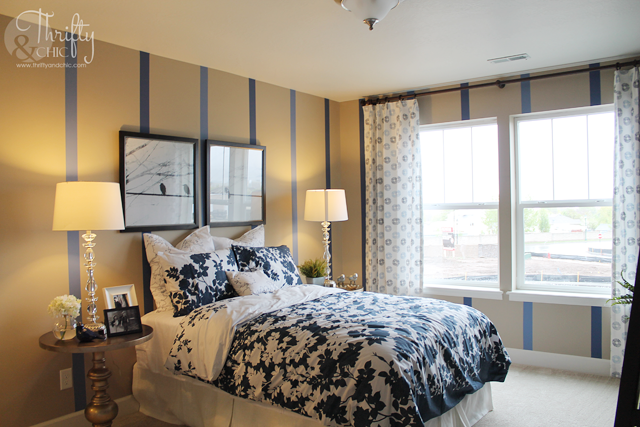 I like stripes, but something just doesn't work with how they did the bedrooms. no to the stripes in any room...I am SO glad wallpaper is making a comeback I love it! Ask who decorated it for them ~ there is NEVER going to be anything better than white cabinets ever...ever...EVER!! "bones" of the house fairly neutral for a buyer. Still not loving wallpaper. 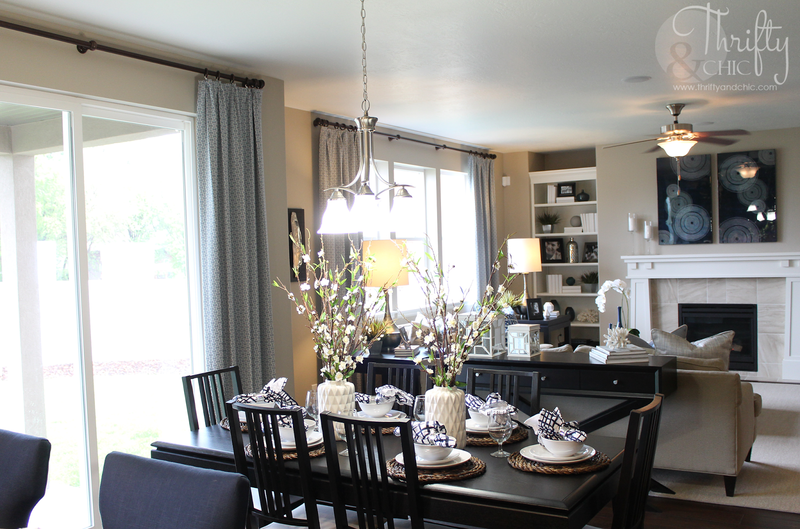 Thanks for sharing...it's always fun to see other homes and how they are accessorized. The stripes of blue are terrible, do not like AT ALL. I also don't understand why EVERY room is blue?? There are many other lovely shades out there too. I loved the kitchen.